Greats of Golf compete in Minnesota's largest sports-related charity benefitting Allina Health. Energy Management Collaborative (EMC) at the 18th green. As a growing Minnesota-based company, we’re honored to celebrate more than a decade of sponsorship of the 3M Championship. Energy Management Collaborative (EMC) today announced its corporate sponsorship of the 2016 3M Championship, which takes place August 1-7, 2016, at TPC Twin Cities in Blaine, MN. An event sponsor since 2006, EMC is Title Sponsor of the Draw Party on Tuesday, August 2, and the Pro-Am events on Wednesday and Thursday, August 3-4. 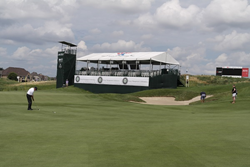 The turnkey lighting solutions provider will greet tournament attendees at its skybox location on the 18th green all week. Three-time LPGA major champion and LPGA Tour legend Nancy Lopez headlines the Accenture Executive Women’s Pro-Am on Tuesday, August 2. During tournament play Lopez joins Jack Nicklaus, Lee Trevino and other World Golf Hall of Famers for the Greats of Golf Challenge on Saturday, August 6. Now in its 23rd year, the 3M Championship is Minnesota’s largest professional sports-related charity, surpassing $24 million benefitting healthcare programs at Allina Health’s Abbott Northwestern Hospital, United Hospital and Mercy & Unity Hospitals. Energy Management Collaborative (@EMC_2003) provides state-of-the-art lighting conversion systems and service solutions in a broad range of industrial, commercial and retail facilities in North and South America. Since 2003, the company's turnkey project management approach, EnergyMAXX, has helped its customers assess and implement each project phase, bringing an immediate and positive impact to their bottom line. A PGA Tour Champions event, the 3M Championship presented by Post-It® Products is one of the favorite stops for Champions Tour professionals. Managed by ProLinks Sports, the tournament benefits Allina Health healthcare programs.